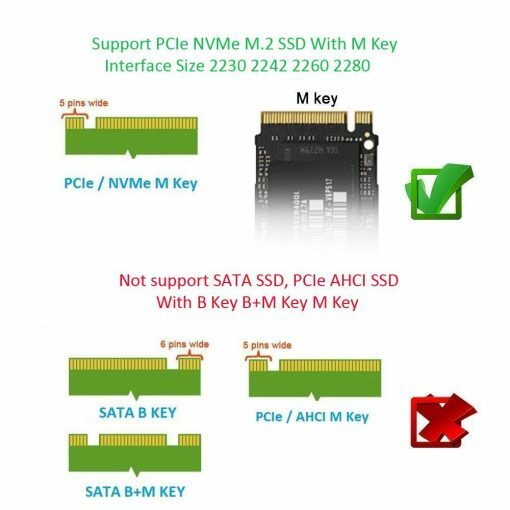 You want to connect NVMe SSDs externally via USB? Here is the right enclosure for it. It accepts one NVMe SSD in different lengths and translates the standard to USB 3.1 with up to 10 GBit/s and mechanical USB-C socket. In everyday life this means that you can reach a transfer speed of just under 1000 MB/second. It should be mentioned again that the case really only supports NVMe SSDs. Older variants, which are managed via SATA or AHCI protocol, do not work. The whole thing isn’t expensive either: for around 50 dollars you can buy one. Update: Added Amazon links to alternative enclosures.